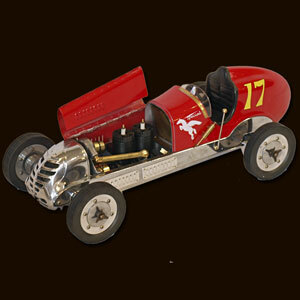 Ref: PC013R The 1930s saw the rise of hand built model racecars, known as spindizzies or tether cars. 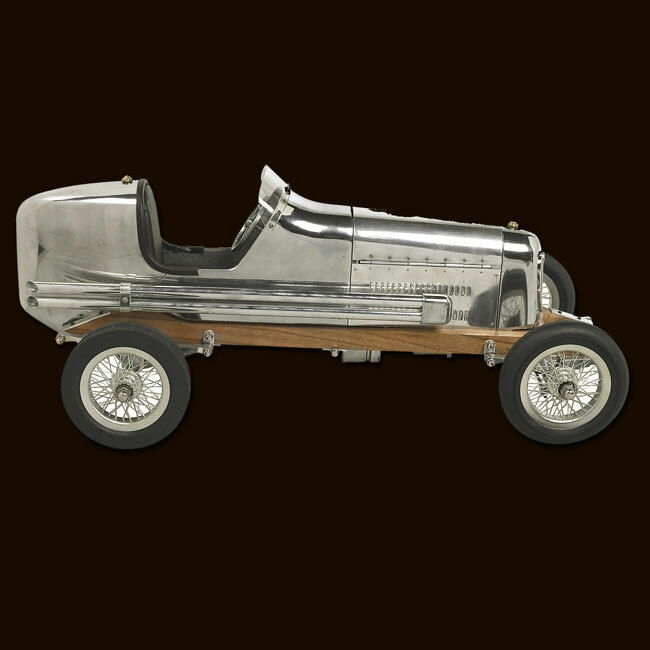 Miniature racecars built by hobbyists zoomed around banked wooden tracks at speeds approaching 150 miles per hour. Resembling the full-size racers of their day, several spindizzies competed at once, tethered by cables to a central pole. Powered by model airplane engines, spindizzies raced against the clock. 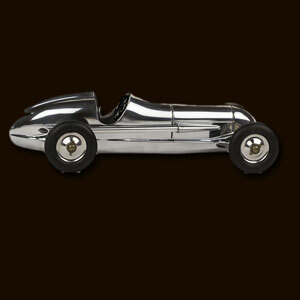 Incredibly detailed and aerodynamic, these miniature racecars were beyond toys: they were pieces of art representative of the best pioneering technology of the era. Constructed using original blueprints our BB Korn model resembles the original down to the smallest detail. One look and youll be ready to join the competition. Ref: PC011 The 1930s saw the rise of hand built model racecars, known as spindizzies or tether cars. Miniature racecars built by hobbyists zoomed around banked wooden tracks at speeds approaching 150 miles per hour. Resembling the full-size racers of their day, several spindizzies competed at once, tethered by cables to a central pole. Powered by model airplane engines, spindizzies raced against the clock. Incredibly detailed and aerodynamic, these miniature racecars were beyond toys: they were pieces of art representative of the best pioneering technology of the era. Constructed using original blueprints our Bantam Midget model resembles the original down to the smallest detail. One look and youll be ready to join the competition. Ref: PC010 Technically skilled enthusiasts of the 1930s loved to race the legendary B.B. Korn cars around the club tracks. Called tether cars or spindizzies, they reached incredible speeds, and inspired thousands to improve and invent. The founder of the B.B. Korn Manufacturing Company, Barney Korn, produced several tether car models that now, as vintage antiques, achieve astounding sums at auction. For the children of his clients Mr. Korn designed and built The Indianapolis, a non-powered pre-war giveaway. It was meant to enthuse children and get them to participate in motoring activities. Our Indy toy car pays homage to Korns legacy with detailed dash, rubber tires, and hand-polished aluminum body.